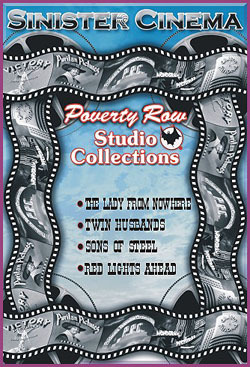 Mystery > Action Adventure Thrillers > DVD > Poverty Row Collections > Poverty Row Collections-New! THE LADY FROM NOWHERE (1931) Alice Day, John Holland, Phillips Smalley, Mischa Auer. A young woman with ties to a gangster is called upon to seduce a detective (Holland) who’s on the trail of Smalley’s gang. They, of course, fall in love, which makes things even stickier. Things get tense when Smalley plots to bump off Holland. The scene where Smalley visits his gang is creepy and well done. Auer is at his sinister best as a slimy hit man. TWIN HUSBANDS (1933) John Miljan, Shirley Grey, Monroe Owsley. Miljan made a couple of good crime films for Chesterfield. In this one, he plays a famed crook who awakens in a posh mansion, only to be told by the butler that he is someone else. His “wife” and personal secretary try to convince him of his new identity so he will help them obtain a fortune in bonds. But what happened to the real husband? Interesting poverty row caper film with fine performances. SONS OF STEEL (1934) Charles Starrett, Polly Ann Young, William Bakewell, Walter Walker, Holmes Herbert. This action-intrigue thriller is about two brothers who own a steel mill. One of them is a socialite while the other is a serious-minded worker who keeps the company together. There are all kinds of intricate plot devices that follow in this well-made quickies. RED LIGHTS AHEAD (1936) Andy Clyde, Lucile Gleason, Roger Imhof, Ann Doran, Ben Alexander. An old timer is offered a chance to invest $5,000 in a gold mine. His wife is definitely opposed, but their kids--all four of them--think it's a great idea. It all turns out to be bogus, of course, but Andy does pull in some fast cash that his kids promptly spend. There's a lesson to be learned in all this but you don't find out what until the very end of this charming little film.